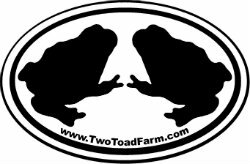 Two Toad Farm organically grows vegetables, seedlings, chicken, pork, eggs, and more in Lebanon, Maine. Offering CSA Shares, Marketshares, Seedling shares, wholesale to restaurants and natural food stores, and retail at the Sanford, Portsmouth, and Rochester farmers' markets. No synthetic chemicals used, No GMO used, no antibiotics used, no added hormones, Pasture-raised, Grassfed with grain supplement Our Veggie operation is no longer certified organic after 6 years in the program. We continue to exceed those standards. cow milk and cheese, goats' milk and cheese. We have shares for everyone: Summer Veggie Shares: Full and Half Shares Marketshares: Save 20% on anything we sell at ANY of our markets Seedling CSA: pre-planned garden. See www.TwoToadFarm.com for prices.